Norma Shearer wears a Parisian dress shop's worth of fabulous outfits and Conrad Nagel plays the least immoral character in this movie as a man with a blatant disregard for the sanctity of other people's marriages. 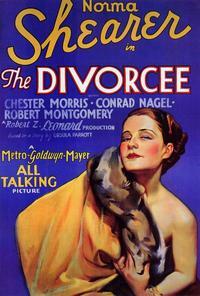 The Divorcee is all glitter and very little gold, despite the last act Jane Eyre hail Mary. David quotes scripture and Suzan makes a plea for someone to put together a Tumblr so no one need watch this movie ever again.